The Arbuckle Family Blog: Do you want to know what I got for Christmas? Do you want to know what I got for Christmas? For all two of you who actually read my blog... I am sure you were waiting in suspense to hear what Justin got me for Christmas. I do want to preface these next few sentences, telling you that I really have an amazing husband no matter what type of gifts he gives me. This Christmas Justin went with a theme. Was it a jewelry theme? Was it a pampering theme? No, it was an "As Seen on TV" theme this Christmas. The first gift I opened was a Ped-Egg. (I did want this). The second gift was "As seen on TV" miracle foot cream. (At this point, I was really getting the hint from Justin... that my feet need work.) The third gift I opened was Aqua Globes. I was like, seriously, Aqua Globes. Who buys those? That is when it really got funny to me. I think that was his way to help me keep my plants alive.. something I greatly struggle with. It all still makes me laugh, especially when I asked him what was going through his mind when he bought those for me. He told me that he almost put the Aqua Globes back because he had spent too much money on the Ped-Egg ($10) and Foot Cream ($10). But he decided to "splurge" and get them for me . I will say that the "As Seen on TV" gifts are not the worst gifts I have ever been given. My boyfriend in High School wrote me a check. Boys take note.. unless the check is for a $1,000 so she can go on a shopping spree, at least get her a gift card. Justin also got a funny gift this Christmas. 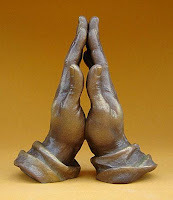 His mom got him these praying hands book ends. They are kind of creepy. I hope you all had a wonderful Christmas! We really had great one and loved our first Christmas with our little girl. If you want to post a comment, let me know what you got (unless it is nothing). I was telling a friend of mine about the Aqua Globes and I made the mistake of asking her what her husband got her. She told me that he got her nothing. He really got her nothing. I felt so bad... my Aqua Globe gift looked pretty good at that moment. What was the worst gift you ever got? 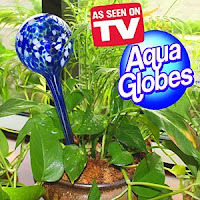 Um, Nicole, I seriously bought the Aqua Globes. I love them! Curtis picks at me all the time about being a 'gadget nut'! But I catch him checking out those gadgets I get. They come in handy. Like the GPS. He laughed at it, but we got to Zebulon yesterday in 20 minutes! HA! He loves it now!